Finally got the first few presents under the tree. Tulle puts the best finishing touches on a present! It’s soft and sweet, not to mention… CHEAP. I got a roll from Michaels for a few dollars and it seems endless. Last weekend, we visited the James Island Festival of Lights with some great friends. We go every year and, while not much changes from year to year, it’s always a fun way to get in the Christmas spirit. Meanwhile, on the organizational front… I’ve been filling up my Graphic Image planner with the most important dates. Y’all, I’m getting married in a little over four months. When did that happen? 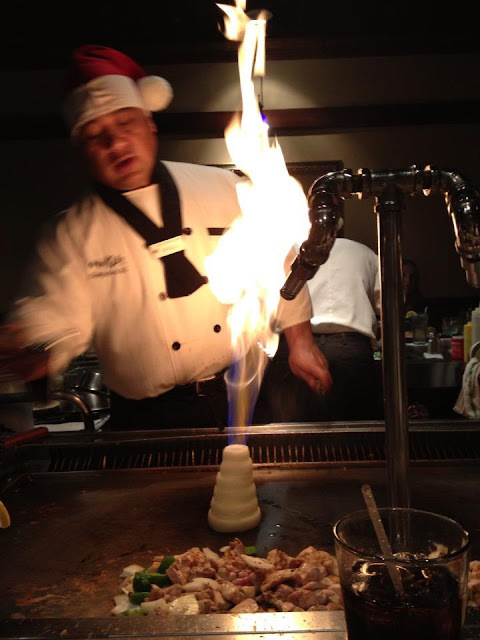 Oh, and a fun hibachi dinner with friends for my MOH’s fiance’s 27th birthday. I have not had hibachi in years and literally ate out of my to-go box all weekend long. I think I’m set for another few years. Mel (Gibson) was our chef. He was too funny! Happy Tuesday. Happy seven days ’til Christmas! I snagged that same wrapping paper from TJMaxx! Love it! I can't believe our weddings are FINALLY getting close!! I've lived here for almost 4 years and still have not gone to the festival of lights. The traffic totally turns me off to it, although, it looks fun! Your gifts look GORGEOUS and that hibachi realllllly made me hungry! The presents look gorgeous! My puppy has been chewing holes in the corners of mine, he's not quite sure what to make of all the decorations! I love the wrapped presents! The pretty pink tulle certainly does make then special. Can't believe there's only a week left until Christmas! My go to has been tulle this year also! I love it!!!! Where is the gold dot gift wrap from? LOVE! That gift wrap looks phenomenal. I love the tulle with it. I love the gift wrap, I've been collecting ideas and these look very easy and impressive!! By the way, cute outfits– you two ladies are so stylish!! Looks like you definitely got into the Christmas spirit, I can't believe Christmas is in less than a week! When did that happen?! Love the tulle on gifts – so simple, yet such a statement! I have the same wrapping paper set. Love it!